In the latter half of the 22nd Century, humanity is running out of time. A global venture, the Sino-American Space Alliance, is funding a pioneering ‘Arkships’ project to colonise distant worlds and escape the dying Earth. 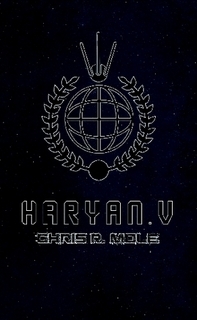 Before the Arkships can be built, however, an advance mission is sent to the most viable planet- a pristine paradise named Haryan V- to establish whether this new world is suitable for colonisation. What the crew finds on the lush surface of Haryan V will change the course of human history. I have contributed short fiction to two volumes of the Sheffield-based ‘Uroborus’ journal, entitled ‘Heaven and Earth’ and ‘The Gates’. I produced several pieces of lore fiction for the ‘Homelands‘ game-book, created by Jackal Pack Games.